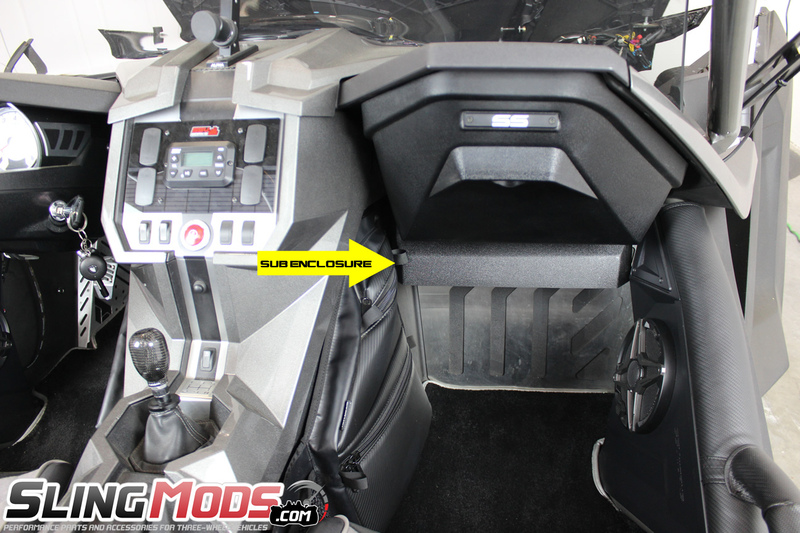 If you're looking to maximize sound in your Polaris Slingshot, you may consider adding one of these Fiberglass Passenger Side Under Dash 6.5" Subwoofer Enclosures by Underground Auto. 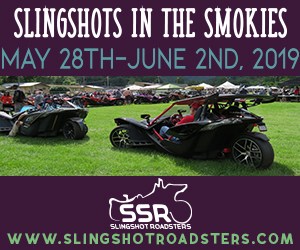 Up until now, the only way to add sub woofers to your Slingshot was by utilizing your rear storage compartments. 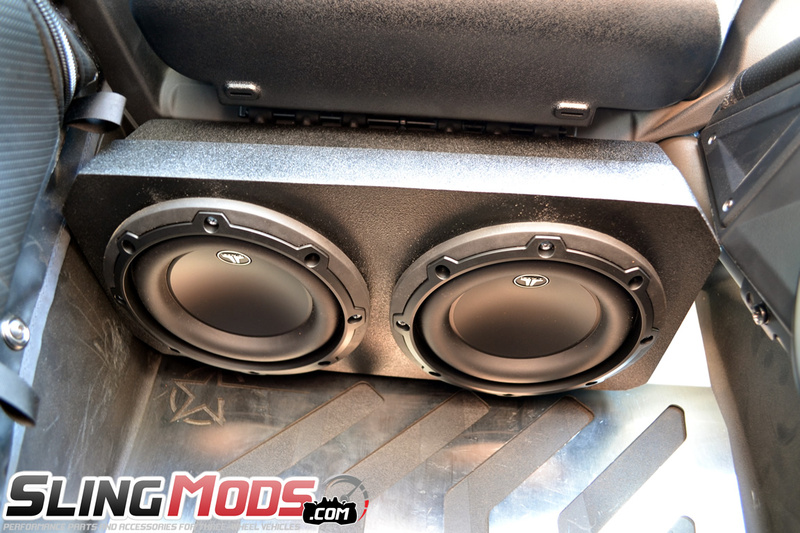 This hand laid fiberglass sub enclosure allows you to mount two 6.5" subwoofers underneath your dash to give you the bass your stereo system deserves without compromising your storage compartments. 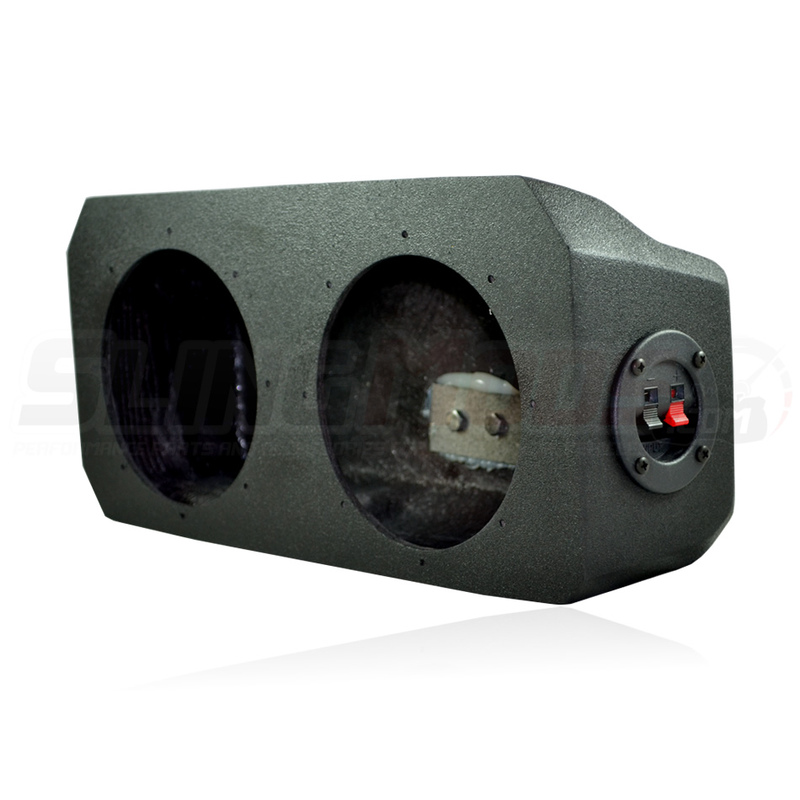 These UnderGround speaker pods come standard with a black textured finish. These pods bolt directly into place and do not interfere with your factory glove box. Got ours installed and they do look pretty good!! 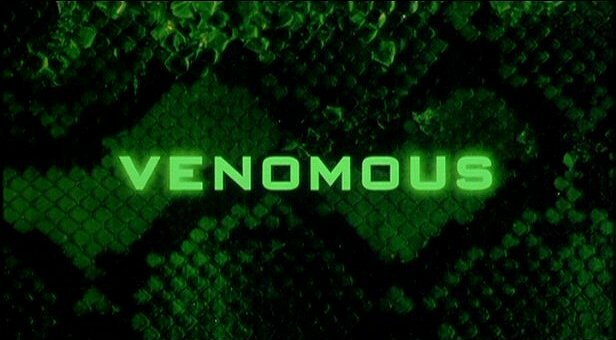 Is there a single sub setup in the works? Like a 10 inch subwoofer? I think just a single 6" also is offered. Two 6" subs at 600w RMS tossed at them. I would say be pretty good for that small space. Bonus you get to keep your back storage. Hey Zx2, only the (2) 6.5" subs. 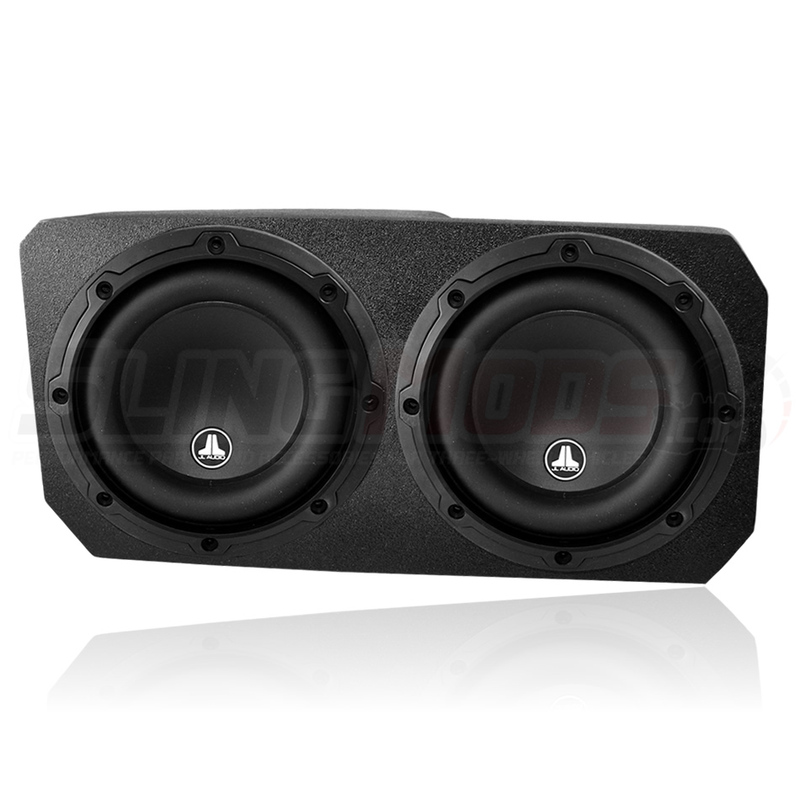 The enclosure is very stealthy and put outs some serious bass out of the JL's. Not sure you could fit a 10" under the dash without modifying. We do have a new 10" subwoofer enclosure coming for the rear that is going to be universal for both driver / passenger and will work with both a 10" square kicker subwoofer or a 10" round. haha. Yes.. they put out some serious bass. A great alternative to peeps wanting to keep the rear for storage. The smaller subs are also very responsive to faster bass notes. Perfect for Rock, Country or Hip Hop. Those small JL subs do a really good job! 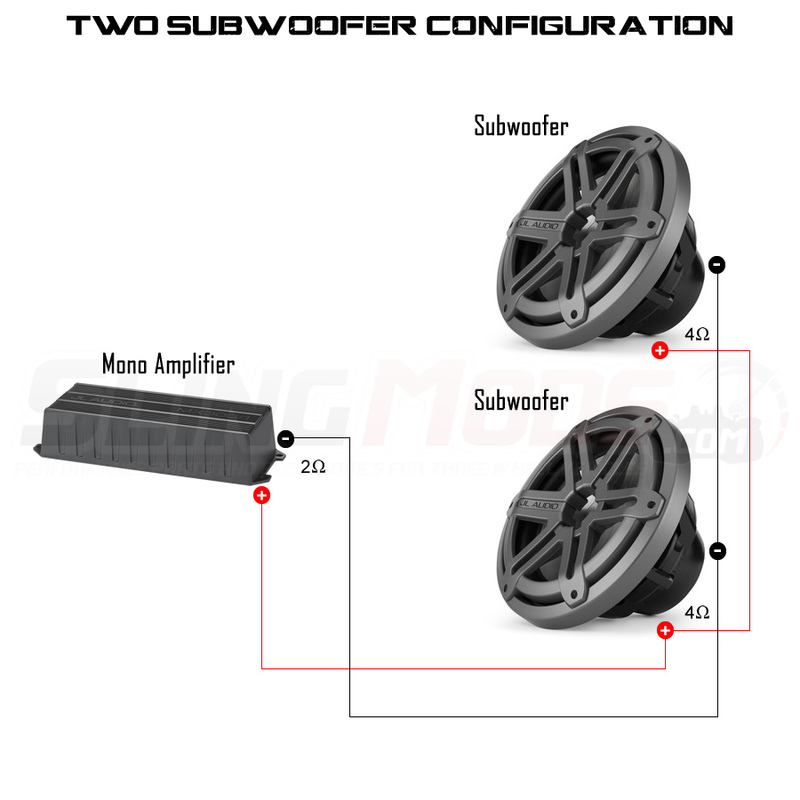 @slingmods - want to confirm, we can drive two 6.5" subs with the one MX300/1 amp? I assume the amp requires dedicated power - is that correct? For what it's worth - I installed this enclosure with the 2 6.5 JL subs and it is impressive. I just finished installing this speaker pod. Kind of fought me but we got it done. 1) neither the JL speakers or the pod provided mounting screws. Had to go to Lowes and pick some up. Just added time. 2) the speaker mounting holes are not predrilled. The picture above shows the pod with holes already drilled. I had to drill the holes and mount. Not hard just something else that took time I wasn't expecting too. 3) I have the SSV front pods and had to remove mine to get this pod positioned. 4) I also have the Slingshot only carpet on the transmission tunnel and the front wall of the foot well. The 3/8" - 1/2 thickness of the carpet seems to take up space needed to maneuver the pod into place. 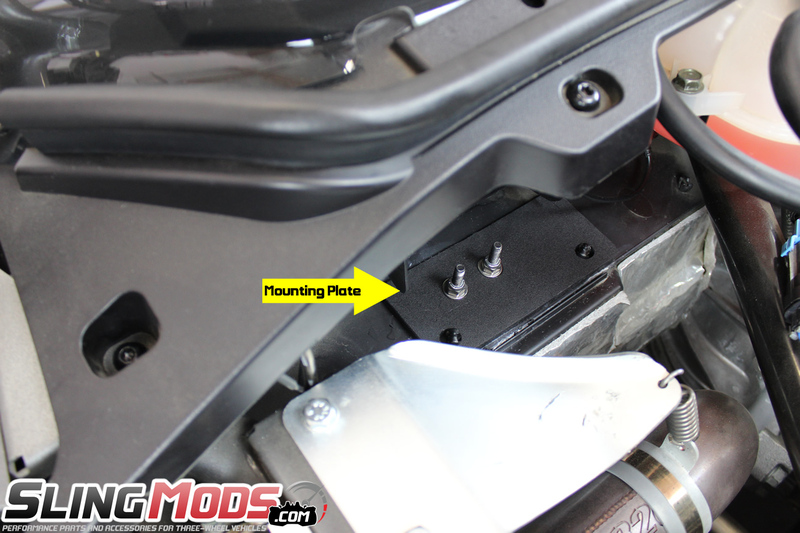 5) The mounting bolts won't cinch down tight. I think the bolts are spinning inside the pod. Because they won't tighten down completely, the pod isn't snugged up against the underside of the glove box area. With my setup, this pod didn't just slip up and in. 6) I was surprised the wire connection was on the right / outer side of the pod. With the amp installed in the back, I ran the speaker wire up inside the transmission tunnel and into the area of the radio. Was fortunate to have enough wire length to fish it on top of the firewall and around the globe box to make the connection. 7) Went to reinstall the SSV pod and I had to really force it past the sub pod - a couple of hard raps with the palm and it got back into position. Yes, the glove box opens but I would say you give up about half of the normal opening range. The JL speakers do a good job and add to the overall sound. With my setup, the execution and fit were much tougher than expected. Edited 3 times, last by Live-a-Little! ( Sep 27th 2017 ). After a good night sleep, I read my post and I thought I should clarify the tone. The box/ pod is well made and has a nice finish. Once it is loaded up with the JL subs and installed, it is a nice add. My frustration was with the install process. Clearly there is limited room under the glove box and the pod is built to use almost every inch. I didn't mention I have the metal fab factory foot plate on the passenger side and I think that is part of the issue as well. The lesson learned for me is that other installed accessories can make the install and fit challenging. Just know this going in and plan for it and you will be fine. Edited once, last by Live-a-Little! ( Sep 27th 2017 ). @Live-a-Little! you said it restricts how much the glove box will open, can you take a picture? Not sure what the normal opening measurement would be. Still functional. I don't use it that often anyway. Hmmmm something to think about. Thanks!! You kinda see in the one picture the top 10% or so gets covered. I am thinking about redoing the entire install, removing the assault plate, addressing the spinning mounting bolt etc. My OCD kicks in and I want the sub pod installed as expected / designed.